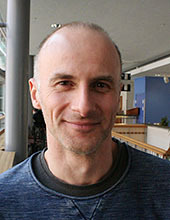 Martin Nilsson Jacobi is professor of complex systems at Chalmers. He has a background in theoretical physics but during his PhD studies he switched research direction into the interdisciplinary field of complex systems. His recent research has mainly been focused on hierarchical organization in dynamical systems, coarse graining in many particle systems, and prediction, design and control of self-organizing systems. Identifying new areas adding larval connectivity to existing networks of MPAs: The case of Kattegat and Skagerrak. There might be more projects where Martin Nilsson Jacobi participates, but you have to be logged in as a Chalmers employee to see them.